Two Octobers ago I went to my first Enchanted Forest of Light display at the Descanso Garden. This is part of that display. When I did this watercolor, I hadn’t yet seen the lights at night. And the afternoon I looked up and saw the star shaped lanterns I knew there must be more to the starry story. I think it was just about that time when a friend suggested we see these lit up on a night later in November. I was keen to do that. But getting back to this watercolor I remember I was again intrigued with using this odd shaped paper and decided it was perfect for this string of daytime stars. When I wrote of this watercolor paper a couple blogs ago (watercolor of trees at the Cayucos Cemetery) I like that it worked there because it added to the feeling of movement of a particular stretch of Highway 1 running between a row of trees and a favorite Cayucos beach. For this one, I liked the idea there was to be movement when you looked up and across from one side of the rose arbor to the other. I also liked that you could see the overhead trellis filled with roses and you knew you were in a garden as well as a special place to see such a display of stars during the day. When I later saw these stars the dark colored arbor disappeared into the night sky and they looked like they were just suspended there as if by magic or some other cosmic “star like” force. I also wrote about the Enchanted Forest of Lights for my January 6, 2018 blog entry—if you’re interested in my continuous obsession with being in the rose garden at the Descanso Garden. Ah me! I realized that when I first saw these amazing larger than life stars dangling from the arbors that the whole garden (not just rose garden) was getting ready for something very special. I started thinking about what it meant to get ready for something and decided that it was really more than just anticipation as you had to get some kind of idea in your head and then actually do something. I guess since I wasn’t responsible for doing anything for this event, I could just enjoy the anticipation. I had no expectations, but was looking forward to seeing the lights anyway. I vividly remember that evening. There were 4 of us in all and we had decided to delay the lights viewing by first having dinner at a new restaurant at the garden. That was a mistake! The meal itself was forgettable, the service slow and it was overpriced. So, there was a momentary bad feeling mixed in with my anticipation for the evening. But here’s the interesting part, when we finally finished dinner we had to get ready to go outside and see the lights. It was to be a cool evening and we had brought heavy coats, hats and gloves. Now I would be ready to see something special without whining about having cold hands. I still didn’t know what I was about to see, so the excitement of anticipation crept in again as I zipped up my coat and plopped my hat on my head. There were no more disappointments after that. The lights were amazing and the moment we walked into the Enchanted Forest I had already forgotten about the forgettable overpriced meal we had endured the first part of the evening. And we all vowed to do the lights again the next year. For the fall 2017 light show we assembled a slightly different group of friends and made reservations to see the lights. We did not endure a disappointing dinner before hand as we went to a favorite near by Mexican Restaurant. (You should know that Mexican restaurants are a definite thing here in California, especially in So Cal.) And after we finished that meal we drove over to the Descanso and got ready to see the lights again—putting on our warm coats and hats before going in. It was again an amazing event and the Enchanted Forest did not disappoint for the second year in a row. This year a similar group of friends are planning another trek to the Descanso to see the lights. I am anticipating that the upcoming evening will probably start again with a wonderful meal of tequila, guacamole, salsa and mole. And I am looking forward to getting ready for the whole evening. Do you see where this is going yet? I think I am kind of stuck on wondering about what we get ready for and then what happens after we get ready. As I’ve already said I see a kind of distinction between anticipation and getting ready as anticipation can actually be done in your head, but getting ready might involve a number of things like buying someone a gift, loosing weight, or investing in the right stocks or bonds because you are getting ready for retirement or maybe setting up a college fund. And as I got thinking about getting ready for things, I kept remembering that I’d heard that expression before. And bang, I remembered that my mom used to say that to introduce many topics for a variety of things we did as a family growing up. I think she used to say it as a kind of reminder that we were supposed to be doing something together. For example, she might say to my dad and us kids on an afternoon in early December, “I was just getting ready to decorate the Christmas tree.” And as if by magic we got the decorations down from the attic, put on some agreed upon music, opened the 5-pound box of See’s Candy and passed it around, and began decorating the tree—with my dad first putting on the lights. Most often my mom used that carrier phrase to announce a meal. She might say something like, “I was just getting ready to start the beans.” Or she would say, “I was just getting ready to put dinner in the oven.” But upon hearing this particular statement my father often said that he was sure my mom had first served the meal we were about to eat to another family because it seemed we were always just getting ready to eat “leftovers” again. So, then I got to thinking, or obsessing if you must know, about different events you could begin by saying “I was just getting ready to____.” And you can fill in the blank however you like. I had fun making lists of odds and ends that could go there. They seemed to fit into odd categories that included: thoughts and deeds, foods and pets, your habits and personal grooming, and finally the musical and important. I had way more on my list than this, but here are a few I thought I would share. tell you that I love you. clean the cat hair off the refrigerator door. eat the last piece of cheesecake. figure out what’s gone bad in the frig. One final final note: Just came back from painting at the Descanso Garden, and the lights are going up. So, I am already getting ready for next week’s blog. What are you just getting ready to do? I saw a hillside of these wildflowers in Atascadero in the spring of 1991. I was riding around in the car with a fellow wildflower enthusiast. Her name was (and is) Aunt Ruth, and she had seen this patch of flowers and took me there one afternoon when I was visiting from northern California. The road we were on was kind of a funny single lane old country road that desperately needed some potholes filled. At one point we jumbled around one corner and she slowed to a stop. Yeah, it was that kind of road—no one was there. The view that I saw took my breath away. It looked like a million paintbrushes had been dipped in red paint and then pushed into the ground, bristles side up. When I say red, it’s so much more than just red from a crayon box, it’s a kind of scarlet that takes some mixing when trying to come up with just the right watercolor color. The irony is not lost on me that these flowers look like paintbrushes and also have that as part of their name. A true painter might use the common name, but a true botanist would not call it Indian Paintbrush. Oh no. They would of course have been just as “gob smacked” as I upon seeing all these “lovelies,” but would have been much more cool. Instead, they would have commented on the very lovely display of Castilleja affinis and not used the common name. It’s just too common and most definitely the incorrect nomenclature if you are that kind of purest. At that time I had already become aware of this taxonomic scoop as I had been working in the botany department at the Academy of Sciences in Golden Gate Park. There I helped prepare specimens for their herbarium, did some pen and ink drawings for a couple botanists and was taking art classes from some of the natural science illustrators in the San Francisco area. I loved it all. I loved traipsing around hillsides with Ruth, I loved traipsing around the Strybing Arboretum, I loved the quiet halls of the botany department, I loved the long and important words I was learning and I loved the scientific, natural science and medical illustration I was learning at the Academy. One of the classes I took at the Academy gave me the idea for this botanical rendering of the Castilleja you see here. First, it’s all about using this amazing Strathmore cold press illustration board—it has a wonderful texture and will take a pretty wet watercolor without rippling. If you start by laying in the dark shadows with Prismacolor colored pencils, the flower seems to immediately take on a three dimensional quality. And as I am scribbling in that first bit of color I am thinking about the colors I will be mixing in my watercolor pots. This is way different from what I seem to be doing now because back then I was more interested in painting very detailed and realistic flowers and trees. So, for this one I didn’t want to set up my paints on that road, I wanted to ponder the paper and colors back in my studio to get just the right layering effect that would make it look so real you could reach out and grab it right off the page. Of course the actual size of this piece is way larger than an actual Indian Paintbrush. But it’s very common to do such illustrations pretty big because if it were to be reproduced in some journal or other, it would be at least ¼, or less, the size you see here. This would give the renderings an even more realistic appearance. So, because I wasn’t going to sit in the dirt and paint I took a bazillion close up photos and did the art back at my house in San Ramon when I got home a few days later. No worries. I have already written about my life with Ruth in my One California Girl ramblings (June 17, 2017). For that entry I inserted a copy of a sweet vase of wildflowers (that had come from her garden) I had painted for her birthday one year. It’s quite a story—meeting the same person three separate and disconnected times in a lifetime. I was first introduced to her when I was 10 or 11, then our paths crossed again when I was doing my student teaching as a senior at Cal Poly in San Luis Obispo and last she became a permanent member of my California Girl’s Club (she was born in Adelaida) as I married her nephew. I’m not married to her nephew anymore, but I have a son that is a blood relative to that amazing Aunt Ruth. So, I am related to her by an unmarriage, which somehow works splendidly for me. I think wildflowers are an interesting thing to decide you like. Wildflowers spend lots of the year nowhere to be seen at all. Then they burst on the scene in all too brief blobs of glorious color and finally they just look like a bunch of weeds. But Ruth and I love them for sure and don’t mind the waiting, or the weedy stage because the blooms are just that special. So, when our life paths crossed for the third time (this by the late 80s) I took up the wildflower mantle and began traipsing through spring fields, always on the look for just such bits of beauty. Since then I have gone on many such walks with Ruth, as well as other wildflower lovers. And there’ve been times when there was no one to walk with, so I went by myself. To this day I still enjoy traipsing through roads and fields in search of those tiny blobs of color. I painted this as I sat at the top of the Cayucos Cemetery, looking down at this row of trees and on out to the Pacific Ocean. The paper is an odd size and shape, 6 by 12 inches, but I liked that it gave the painting a sense of movement as the railing you see running through the trees separates this property from Highway 1. Highway 1 in southern California is also called PCH, or Pacific Coast Highway. I’ve never heard it called PCH by the people who live in the Central Coast, but whatever it’s called, this little stretch of very busy road connects Morro Bay with the actual town of Cayucos. These trees are pretty big and cover part of a beautiful beach that my son and I frequented when he was little. I like to think that my mom and dad, who are buried high up on this hillside cemetery, face that narrow stretch of beach and ocean view. This stately row of trees got me thinking about what this view looked like when the trees were first planted and much smaller. Then you could have really seen the beach and ocean, but of course then you could have really seen the cars whizzing by on Highway 1 as well. I think I’m OK with the trees blocking the view of the road, but I would be pretty sad if you couldn’t see the ocean. When my dad died, a close family friend had a small tree planted (some kind of conifer that will do well in the damp Cayucos beach climate) in my dad’s memory. It’s on the left side of where I was sitting, about half way down the hill. For the longest time I wasn’t sure which tree it was, as the marker that was to go with it had not yet been fixed into the ground. But once I was shown the tree, I was really touched with such a thoughtful and fitting gift to mark a significant moment for our family, sad as it was. Trees do that for us. They can signify important events in our lives. Maybe it’s a kind of immortality as we hope that future generations of visitors, whether they are related to me or not, will come visit the tree and make sure that it is still thriving. And then of course the tree will grow bigger and become something we hope will stick around for a while. Besides, my dad loved trees. He and my mom were always planting them in the various houses we lived in growing up. So, when my brother sent me a recent picture of my dad’s last tree, with my brother standing beside it, I could see that it had already gotten taller. That was wonderful. So, then I got to thinking of other times and other trees. Most that came to mind were planted right here in California. And it would be fitting to start with some trees my mom and dad planted in the corner yard of their house in Grass Valley when my son was a baby. I’m not really sure why they chose the three liquidambar saplings to commemorate his birth, as it is not really a common tree for that part of northern CA. My mom and dad were mad about sugar maples and had already planted several of them along with 6 or 8 pistachio trees. But the liquidambar were chosen and planted nonetheless. Somewhere in my photos is a wonderful picture I took of my mom and dad holding their first grandchild in front of the three 4 to 5 foot trees. By the time my son graduated from high school and we moved away, those trees had become giants in that corner of the yard. When my mom and dad first moved to that house in the mid 1980s I remember my mom saying that they wanted it to look like a park, and I must say they succeeded. By about 2008 or 9 the trees were so big and beautiful in their yard that there wasn’t much room for other plants that needed more sun. Oh well! But every fall, throughout the years, we watched the sugar maples, pistachio trees and liquid ambers turn stunning shades of yellow, gold, orange, red and pink. (Yes pink!) It was quite a site. And when the first big winds of fall began to blow, the leaves dropped to the ground like so much colorful confetti. It took days to rake that up—mostly because my son and I liked to play in the piles I tried to rake up. I haven’t been back to Grass Valley since my son graduated, so I am assuming the current owners of mom and dad’s house has left my mom and dad’s park alone. I guess I don’t want to find out if any trees have been cut down. I think it would make me feel too sad. There’s another cool California tree story that took place around the corner and down the hill from my parent’s Grass Valley home. That story actually starts with the end of a giant sugar maple. It had been brought from Gettysburg as a sapling and planted in front of an old farmhouse (pre Civil War) on that street. It was huge and every fall it was covered with huge bright yellow leaves. I think it was 2010 or so that a big winter storm blew off one of the last great branches of the tree. So when it had to be taken down it made the headlines of the local newspaper. But the story doesn’t end there, of course. An old timer who lived in the house next door to the tree, said that a seedling from the Gettysburg tree had planted itself in his yard when he was a young boy. And he said he and his family watched that tree grow, much like the families who watched that first Gettysburg sugar maple. In fact, the old timer himself was something of a marker of time in Grass Valley as his ancestors had been some of the original Cornish tin miners who had come to the area to mine for gold just after the Civil War. He was born, raised, married, had children and died at age 93 in that house—so he saw the first tree in its mighty glory, all the while his family cared for the next generation tree right there in his yard. He was very proud of being part of that tree’s legacy. He was also very proud of his Cornish ancestry as well. Great tree and human story, huh? But I guess I do have a couple more short stories about trees, but neither take place in CA and for that matter, neither of them actually happened. First, if you would like to enjoy a large, but fictitious tree, in a mini-series, check out “Parade’s End.” The story was written by Ford Madox Ford and adapted into a screenplay by Tom Stoppard. In it there is a magnificent and huge tree that is actually an important character in the story, and it is called the Groby Tree. Check it out. Finally, I will share a picture book with you that a little student I saw yesterday shared with me. 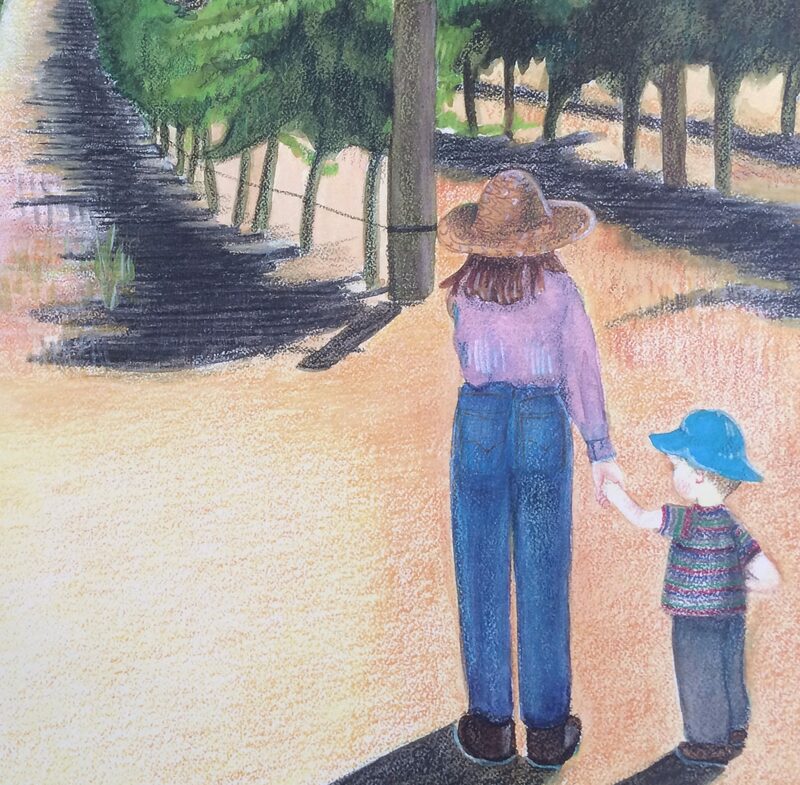 The title of the book is “Our Tree Named Steve,” by Alan Zweibel and illustrated by David Catrow. If any of what I have written about today resonates with you, you will love this story, and the illustrations are so clever and wonderful! If you don’t have a little friend to share this book with you, I hope it’s still in print and you can find it. I miss you dad! (10/12/12) And thanks for you and mom for planting so many trees.